The pesky RIONO-HOEK and his dastardly cohort attempt to steal two chests full of LORD DOOM's loot. They almost got away with it too untill a guard watching after one of DOOM's Dragon Knights horses spots them making a quick escape via boat! 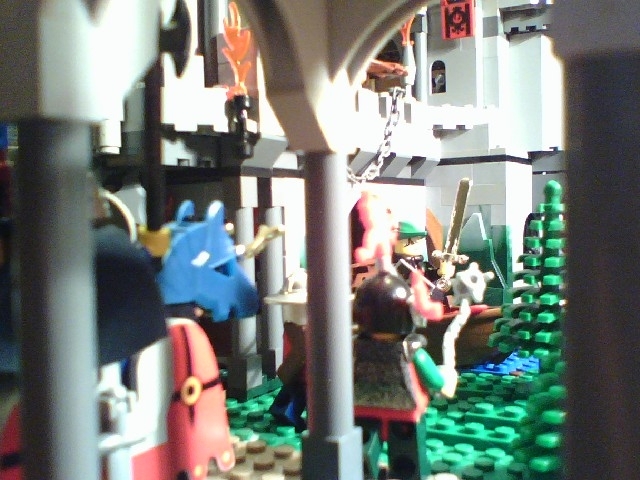 LORD DOOM CALLS HIS GUARD TO ORDER, and the tower of Vyk-Maugh rumbles with activity. Nicely done, well worth the two evenings you set aside! I like how you used the KKII elements to make the base of the bridge. This is a very well constructed MOC. Good job! Nicely built, I have no complaints! I just dropped nearly half of my entire paycheck on SAH. I hope some of my new goodies arrive soon! This is cool. I like the doomed....I mean domed structure, the bridge and the use of the rocket pieces at the top of the spires. It seems like a fun little play set. Thanks you guys. I kinda had "Playset" in mind as I was designing it. I know it's really fairly small and utilizes some KK2 elements that people don't really seem to respond to very well, never the less I was pleased with the end result as far as the towers architecture and that's why I posted it. I actually build a lot of MOC's that I never post simply because I'm not satisfied enough with them. This one however made the cut. Just barely. Plus I love me my Dragon Knights. Very nice, the gazebo-type thing is my favorite part. The landscaping looks very nice as well. And yay for my first post! This is a nicely constructed MOC. I like the little gazeebo thing. It looks very clean. Nice job! P.S.- You have a PM. The landscaping is I think pretty good, but as Darkspawn said, it could have even used more. You should go to the lego store and get a bunch of plants. They are really cheep. Just fill a bucket with one of them. Well, thats a nice little castle.